Here at homify, we're pretty fond of the more colourful aspects of home interior design: those vibrant, rich and dynamic ingredients that really make an interior shine. You'll frequently hear us discussing and celebrating the virtues of bright, wonderful colours, tones and textures when it comes to fitting out really fantastic domestic spaces. But you know, we must admit: colour isn't always everything. Above and beyond, we believe in balance; not to mention keeping things in perspective and always taking into account the innate needs of a given space before applying any sort of aesthetic treatment. So with that in mind, it's worth remembering that colour may not always be the answer… and the alternative is far less scary (or boring) than you might imagine. Indeed, there are so many virtues to keeping an interior space white: purity, cleanliness, a sparkling domestic feel—these are just a few moods and sensations that an all-white household can evoke. After all, white is the ultimate classic tone, and indeed, painting and fitting out your rooms with it can make for a truly dazzling statement. Today, we're paying an homage to the glories of white, with a veritable selection of fantastic white home interior examples. Take a walk through and take some handy, all-white hints on how to make your home just as wonderful. Does it get any sweeter and more appealing than this fantastic example of a brilliant white living room interior? Note the freshness that this room exudes, the elegant simplicity of the dashing white against the polished wood grain flooring. Simplicity really is one of the greatest assets of any home interior, so when it doubt, always remember that less is more. Here, fresh painted high grade white walls and ceilings create a vibrant space, fusing harmoniously with the white lounge seat by the white bay window heater, and the stylish modern white lounge chairs by the sheer glass table. The natural light from the bay window, not to mention the thoughtfully selected halogen globes from the ceiling, can't help but exude their full potential in this space, drawn and spread decadently about the space. This is a room that'll leave you feeling optimistic, elated and harmonious more often than not. Why stop with the walls and ceiling when you can go the full white experience? Nothing exudes a sense of unique contemporary charm like white-toned wood grain. Here in this fabulous bedroom opening, we see how white-stained and varnished wood for the flooring creates a dreamy, majestic inclusion to an interior space. While appearing rather stark on its own, when used in this context the white wood actually gives the impression of warmth and invitation. Fusing neatly with the all white paint of the walls, ceiling and wardrobe, it's punctuated with stylish flair by a bold, orange corner design chair—this is a fantastic example of how you can play with a bold motif: by adding an equally striking colourful element as a juxtaposition and point of reference. White in the bedroom conjures emotions of purity, piety, deluxe slumber and sheer luxury. Of all the rooms in the house, it's perhaps the bedroom that stands to benefit most from a clean, white interior treatment. The example here certainly perpetuates white's fine reputation. 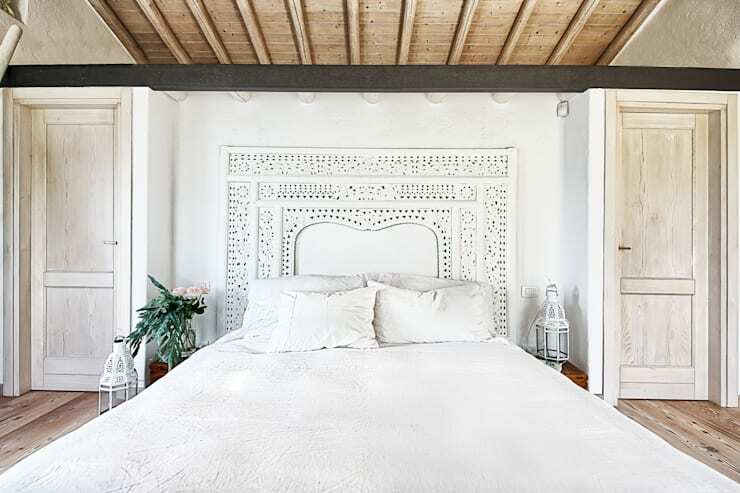 The use of white linen on this King size bed marries gently and effortlessly with the rustic feature wall: an exotic, almost subcontinental flourish, enhanced further by the presence of the vintage white lamp to the bedside. Here, we see again how white can be used amongst a blend of characteristics: the tone holds strong, remaining the feature of the room, but it plays well off the exposed wood grain of the ceiling to create a far more diverse space with a great deal of charm and depth. To the bathroom! Se here, the virtuous effect of white in the bathroom. Indeed, bathrooms of all types, styles and designs were made to be fitted out with a pure white aesthetic. So it was in the days of Rome and Greece, and so it can still be in today's modern age if the space demands it. For a modern home, a sleek white bathroom will always deliver. 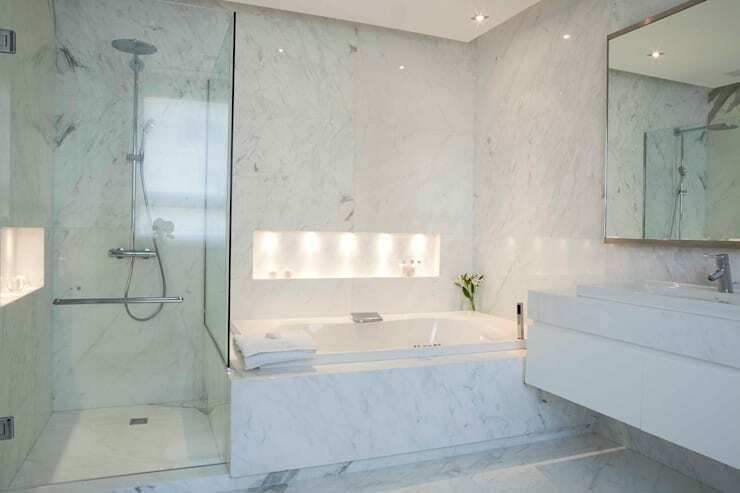 In this case, it's not pure white that works so well, but the infusion of white marble right throughout: the oversized luxury bath, the vanity and sink area, and the exemplary shower space. White marble gives off a feeling of effortless opulence, a mood of relaxation and harmony, and the sense that you are royalty (or at very least nobility) right here in the warmth and comfort of your own home. If you need some assistance with your bathroom design, chat to a professional to get some stylish ideas. White has a tendency to really maximise the magnitude, presence and depth of an interior space, in particular when that interior is rather spacious. This tenet is clearly on show in this fabulous example. Lending itself to an innate minimalist approach, this broad, long and wide open plan kitchen is the embodiment of contemporary minimalism: sleek lines from the left wall, to the floating bench space and dining area; clean, open glass windows fetching maximum natural light; plain, though characterful raw grain timber flooring; a basic though beautiful wooden table with symmetrical leather chairs. Everything in this space has it's function, and is stripped back to its basic essentials—what else but pure white tones to fuse the space together and its internal attributes into one cohesive, modestly dynamic, pure room, rich with depth, charm and an effortless sense of breeziness and flow. Don't fear all white! Whether it's a large space or a small one, white can really come through with the goods. 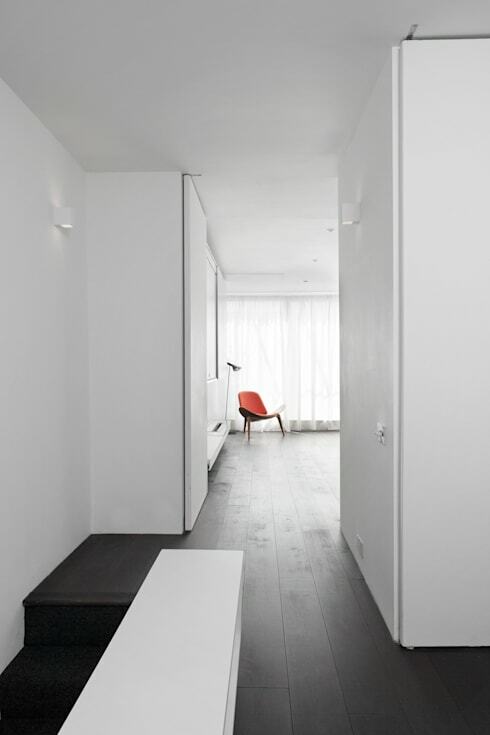 White works to enhance even the tiniest of spaces, and here is a very neat example of what's possible. 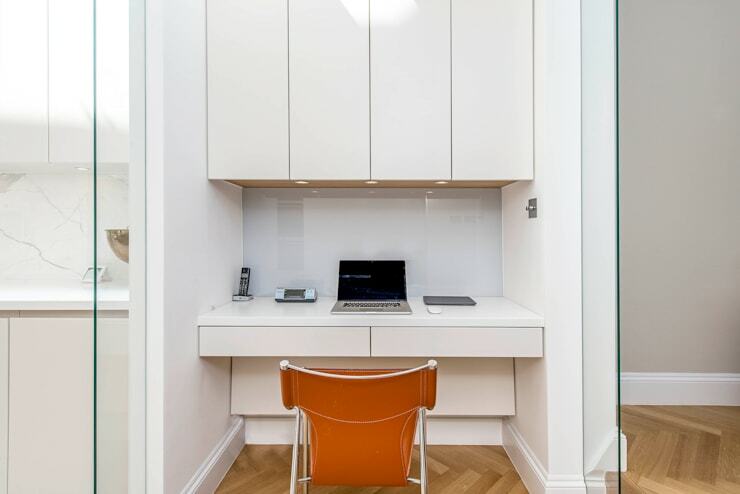 In this scenario, we have a study space perched in a thoroughfare, yet with the white treatment on its cupboards, walls and central desk unit, it gives the impression of being a much larger space than it probably is, to the point where it's perhaps even a room in its own right. Again, we see how white lends itself to colourful punctuation with the right choice of accessory: in this case, an aesthetically pleasant orange desk chair, to say nothing of the fabulous parquetry of the floor beneath. What do you think of these all-white interiors? We'd love to hear from you in the comments below!